Last night we went to Zakkushi on Main Street, which for us always means gluttony, depravity, and utter disbelief when the bill comes. The thing that’s great about izakayas is that you can graze all night long while pretty young waitresses bring you large pitcher after large pitcher of cold Japanese beer, but the trouble is that while those two-dollar skewers of meat don’t seem like anything in the first place, by the end of the night you stumble and yell your way out into the parking lot, your belly is swollen and your waistband is the cruelest thing you can think of, you have the meat sweats, and you don’t know how you’re going to find the money to buy groceries or eat for the rest of the week. This all means of course that I had tons of fun and regret nothing. And when we got home late last night (or early this morning), I was exhausted. I whined to Nick that I never get to sleep in, because the cat loves me most at 6:00 in the morning. He reassured me that he would get up with her and feed her, and that I could sleep late, and that the remainder of the weekend would be flawless and spectacular. 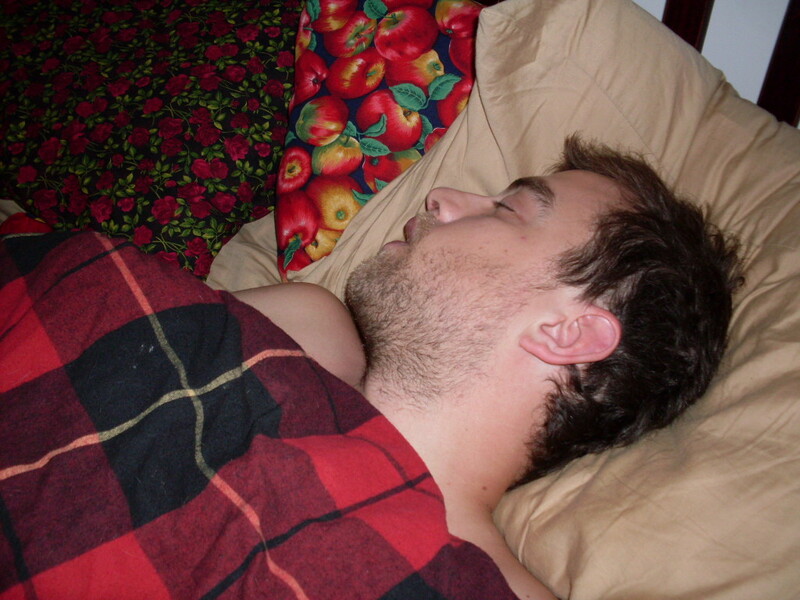 This is what Nick looked like at 12:38 this afternoon. Molly Waffles takes her breakfast at 7:30. Needless to say, I had to get up and feed the cat and clean the litter box and entertain myself for more hours than I care to mention. Fortunately, yesterday I put a 750g container of all-natural, organic, 5% milk-fat yogurt into a bundle of cheesecloth and let it drain overnight, thanks to a recipe I discovered at GrongarBlog for yogurt cheese. 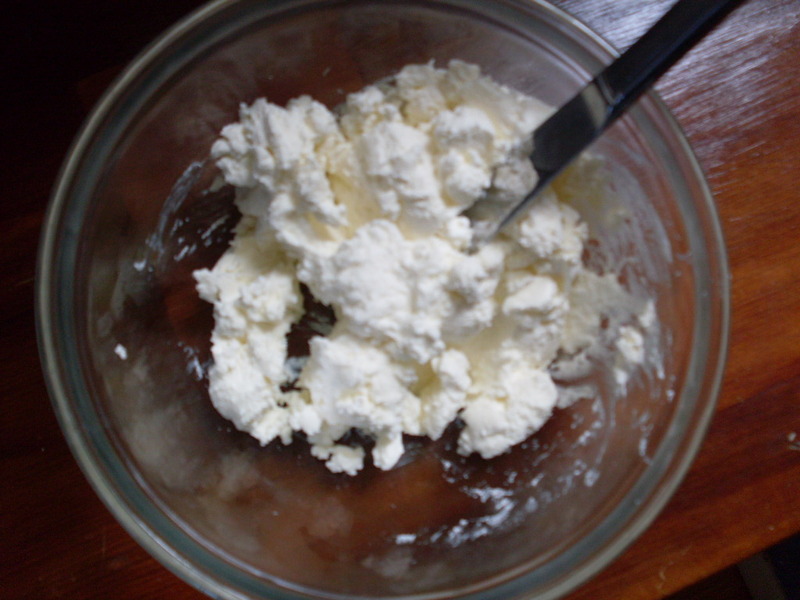 750g of yogurt (about three cups) produced a little over a cup of creamy cheese. My goodness, you guys. This just improved my whole life, and why the hell didn’t I think of this?! The cheese that resulted was creamy, like softly crumbly cream cheese – I put the yogurt up to drain around 7:00 last night, and mashed it into a bowl around 10:00 this morning. I knew at once that I would have to trudge down to Granville Island to Siegel’s for bagels and to the smokery for fish. The effort and patience required to make the cheese was minimal, and the payoff was more than was deserved for so little involvement in the process. I recommend making this today for tomorrow. Make sure you get good bagels and smoked fish. 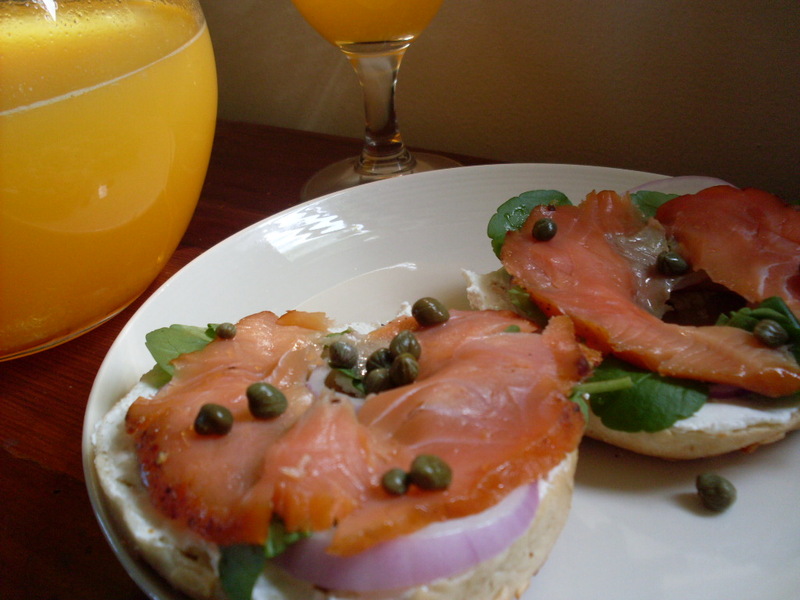 Watercress, red onions, and capers also help, as does fresh-squeezed orange juice and good enough white wine. More information about cheese-making is available at GrongarBlog, and while you’re there, browse around. Her feta is next on my list, and we’re in the process of trying to track down a cheese press to make that gouda. Tonight my dad and I are going to see Stompin’ Tom Connors, arguably Canada’s finest and most awesome musician (Celine Dion? Rush? The Arcade Fire? Your argument is invalid). And tomorrow, ribs. I hope you also have a fantastic weekend, and that you get outside and have fun! But first, make cheese. < Previous Meatless Monday: Fried tofu with plum sauce and some rambling. Next > Meatless Monday: Shepherd’s Pie, sans shepherd. Ohhhh yum!! Looks terrific, I’m more apt to make the bagels than the cheese bit, but maybe I’ll give it a go. Thanks for sharing!! Sounds delish…I am heading to the farm market now to buy yogurt and get started. I’m going to make cheese and you’re going to be so proud of me!!! Yay! I am glad everyone’s trying this. I ate some with jam and it was awesome, but salted some more to eat plain on bagels. On its own, it needs a bit of salt. But still, oh wow. Beautifully done!! Congrats! Can’t wait to read about your feta, too. You will LOVE it! It’s true, Nick’s life is just one big gorgefest with interim naps. His life is so hard. My grandma made all the pillow cases, and I inherited a million of them, so even though we got nice, respectable sheets as wedding gifts, I never use the pillow cases that came with them. I use my grandma’s pillow cases, which never match but are so colourful and I think they give me nicer dreams than the plain old store-bought ones. The cheese was good! The smokery is a ten minute walk away! You can move in anytime. Temptress! I’ll have to renew my passport before they’ll let me, for sure. 🙂 I oopsed and let it lapse. HECKYEAH! My favorite is with lemon zest and oregano. Dill is also fabulous. Fresh, of course. My mom used to make this in the 1970’s when she could get fabulous whole fat yogurt from the local university dairy lab. My experience with it says low fat and fat free yogurt does not work well. This is in my mouth right now. On bread with slices of tomato with lots of pepper and salt. That link you gave me by Jeffrey Steingarten… he says he eats tomato sandwiches often. Yay!